It’s that time of the year again: the time to do your tax return in Germany otherwise known as “Steuererklärung”. Yes sir/m’am, you’ll be able to get money back, and sometimes up to a few thousand euros. We show you how in this step by step guide. Should i be doing one? So how can I do my tax return in Germany? I don’t feel confident filling in my tax declaration in Germany alone, how can i get help? What is the tax return deadline in Germany? When will i get my money after submitting all the forms? What should i do if i am unhappy about the results, or if some things were misinterpreted? I have received income from abroad the past year; how should i go about this to avoid double-taxation? I have left the country already, can I try to do a tax return and will the Finanzamt transfer the money to my foreign bank account? Before your panic when thinking “I haven’t done my tax return this year!”, let me assure you that you won’t have any problems with your Finanzamt if you forgot to file your tax statement. As an employee, you are taxed every month off your wage. If your salary is your only income, then it will be a piece of cake to get your tax refund. You have already paid your taxes, now your job is to obtain as much refund as you can! For freelancers, it’s of course another story as it is compulsory. The average tax return in Germany is close to 1000€ nation-wide. Sounds interesting doesn’t it? Additional income (not from salary) superior to 410€. Salary replacement income (like unemployment benefits) superior to 410€. More than one employer in the year. More than 2 salaries (like a full-time job and a minijob). Married with tax classes 3 and 5, or both 4 “mit Faktor”. More info on tax classes here. Divorced and re-married the same year. However, even if you don’t have to do it, you may as well do it, as there are chances you get money back too. If you are confident enough to do it on your own, do as follow. Otherwise, jump to the next title. First you have to make sure you get all the right papers. It is recommended to download the forms directly from the official website this way : here. On this website, it is also possible to download an official tool called ELSTER (ELektronische STeuerERklärung) onto your computer. This tool enables you to proceed to your tax return in Germany via the internet, saving both you and your Finanzamt a lot of time. You need to sign-up for an account and you receive your password by post. Honestly from there, i will gladly direct you to one of the best guides made in English around by our good friends of ToyTown Germany. It is very neat, clear and complete to do your tax return in Germany in English properly. I don’t see how i could give better information on how to fill in all those forms. Send them to your local Finanzamt. Wait for 1 or 2 months before you get any answer, and hopefully, a little ka-ching will appear on your bank account so you can afford this awesome guitar you spotted, or else, paying for your holidays to Croatia. 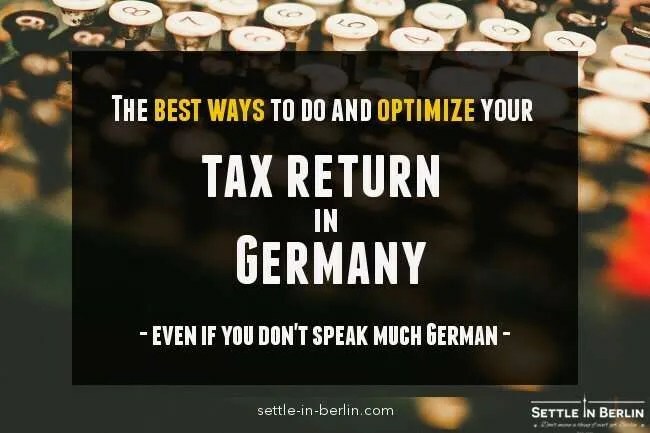 If you are not so good with numbers or a bit scared of doing mistakes because of the German language, there are other ways to do your tax return in Germany. If this is too much to do, there are also online tools that make it super easy to get your tax declaration in Germany right for a maximum return. You might consider SteuerGo for example that i can really recommend for employee and freelancers alike, especially if it’s your first time. Your hand is really guided step-by-step with the tool in a clean interface. Save progress at any time when you register for a free account. It’s also fully in English (!) at every step of the process. You can even call a hotline if you have questions. additional forms like (Einnahmenüberschussrechnung (EÜR), Umsatz- und Gewerbesteuererklärung). It only costs 25€ which is perfect when you don’t earn enough to afford a Steuerberater. SteuerGo does not support one thing for employees though: if you have had a foreign employer that year. In this case, you can turn to platforms like SmartSteuer which also supports that (No English though). You can also turn to professional tax advisers in Germany for this. A Steuerberater is a trained agent capable of preparing, processing and submitting your tax declaration in Germany. They are accountants usually experienced into finding particular rules that is relevant to your tax profile to optimize your return. Even if their fees are controlled by certain laws, you usually have to pay a few hundred euros for their services. This is why it’s only relevant if your situation is a bit more complex like earning relatively well, being married, having kids, owning a house and having different sources of income. It’s also quite normal for freelancers and self-employed persons to have one. If you don’t know where to start your search for a Steuerberater, you can turn to platforms like Ageras. They search and find one for you based on your profile and needs. The service is free and the offers you receive non-binding. In theory, the deadline is to the 31st of July of the following year (for people that obliged by law to submit one). However, you can ask for an extension if you are short on time. Using a Steuerberater allows you to have even more time, as they have until February of the year after to do it (eg: a submission in Feb 2020 for the year 2018). Be aware that there is a penalty of 25€ per late month. As an employee, you can claim a tax return for up to 4 years prior the current year. Pretty handy if you forgot to do it those years to maximize return. If you think the Finanzamt made a mistake to process your case, it is possible to protest and open a case (Einspruch) to explain your situation, within one month after receiving the Steuerbescheid. When this happens, your wage is being taxed at the maximum rate possible. It is possible to get the difference between that rate and the normal rate back when doing your tax return the following year. The Finanzamt requires of all German residents to declare any income sources, even if they are coming from abroad and have nothing to do with your life here. If that income was already taxed from that country, you might avoid double-taxation if it has agreed to a tax treaty with Germany. If so, you can do that by filling the Anlage AUS – Ausländische Einkünfte for your declaration. More info about that here. Absolutely, you can do a tax return for the year and months you left the country. The Finanzamt will transfer you the money in your foreign account if you give them all the necessary information, and a specific request to do so. You will very likely support the costs of the transfer on your own. Ps 1 : Don’t forget to sign all those forms, otherwise they won’t be processed by your dear Finanzamt ! Ps 2 : If you feel like you are running out of time, you can let know your Finanzamt before the 31st of July you need more time. They usually give you an extra 2 or 3 months to do your tax return in Germany. great website with lots of information. Thank you for that. I have a question regarding tax for non-resident. Together with my wife, we were living and working in Germany for some time. Last year we moved to the UK, my wife moved in March and since then she started to work in the UK. I moved in May and I was receiving German unemployment benefit II for half a year and did not have any other income from the UK. Previous years we always did our tax return with SteuerGo but now I have big problems with filling my wife’s income from the UK. I assume we are should be considered as non-residents for last year since we both spend less than half a year in Germany. Do you know in which point to fill up income from the UK as a non-resident? Hey Krsysztof. I would not know sorry. Maybe reach out to them directly. i have not yet submitted my tax returns for the year 2017. and meanwhile I moved to Berlin from my last place near dusselsorf. so my question where should i submit my tax returns for the year 2017? in berlin or dusseldorf? Hey deep, you should submit it wherever your current residence is. Hello! I’m in need of some huge help so thanks in advance. I’ve lived in Berlin for 1 year and I’ve worked 6 months in a Part time job, all legal. I left the country in October’s 2017 (with the Abmeldung), but I still didn’t take care of the taxes. Is It mandatory even though it was a part time job? How can I do it? Will I get some refund? For 6 months the total was like 3.000€ and something euros. Hey Joana. As stated in the post, if this was your only income, it is not mandatory. I have a question. I am self employed. And I didn’t made a tax decleration jet for 2017, and today I received a letter from finanzamt. Kind a informative, something about 5000 euros. My incomes was around 16.000 that year. Is that could be true, 5000 euros ?! Hey Zane. Impossible for me to say on such little details sorry. I have started working as a Phd student since July 2015 and I have never done the tax return in Germany. Last year, due to some organizational changes I had to change my contract from MPI to University of Munich. I did not know when my employer is changed, I am obligated to do the tax return and I have never received a letter from finanzamt that I have to do it though. Now the question is whether it is possible to do the tax return for 2015 or not ? what will happen when I had to the tax return but I did not do it since 2018 ? Hey Siavash. Yes, you can still do 2015. You might receive a fine if you had to do it, but didn’t do it. I have a short question: Since I am married, but my wife and I are employed differently – she is a freelancer, while I am on a full-time contract. Do we have to file our tax returns separately or file them together as a family unit? Hey Yanis. Both options are possible. I was wondering if you could write some information about tax return for the doctoral students who are working while studying on their thesis at university or research institute. Hey Fatemeh. Would you direct me the right information if you have experience on this? Hey Jeen. Permanent residency has no impact on whether or not you can do a tax return. You were effectively a German resident. If you haven’t done that already, you can do all years from 2016 to 2018. I think you have helped lots of english speakers in Germany by this website and thanks for that. I was wondering if you could let me know that SteuerGo is an application for submitting the documents or only estimation of the money that we got? Hey Jeen. They also submit the documents on your behalf as well. You have written “Important note: employees whose sole income are their salaries are not required by law to submit a tax return. ” Would you please let me know where I can find an official document which mention this? Hey Mohammad. That would be here. I am so thankful for your response. However, I was not able to find this code: “employees whose sole income are their salaries are not required by law to submit a tax return” or something close to this in the link given in your response. I am living in Canada now and the Canadian Revenue asked me to either provide the notice of assessment from Germany for the tax year that I was in Germany or show them on official document that I didn’t need to file my tax return. I don’t have the notice of assessment of my tax in Germany since, as you wrote, I have been told be my colleagues that I don’t need to file the tax return since my only income was my wage. This is why, I am trying to find this code and I spend hours to find it in internet, and any help would be extremely appreciated. Hey Mohammad. Well i don’t know what else to give you. The page i linked to is the actual piece of law stating who should or shouldn’t submit a tax return. Sorry. In 2018 i had in Austria a half time job . From september i moved to Germany and I’m working currently in a full time job. My question: For the Steuererklärung, do you think I should declare what I worked in Austria, or should i only declare the things from the point i moved in in Germany (september untill december)?